Winner of "Branson's Best Comedy Show", you don't want to miss this amazing comedy and musical extravaganza! This highly entertaining variety show is famous for family friendly Ozarks fun. 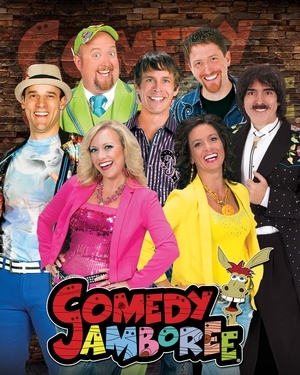 Comedy Jamboree features some of the funniest comedians in Branson! Starring funny guys, Applejack, Stretch McCord, and Andy Parks, get ready to laugh over and over again. The whole family will get a kick out of the audience participation. Sometimes the guests steal the show. The Jamboree Singers; pianist extraordinaire, Tracy Heaston, and the award winning Grand Band, will rock you with kickin' live music, talent and showmanship. From hilarious, clean comedy and floor pounding dancing, to today's country hits and gospel classics, this show is a HOT TICKET! For an amazing afternoon of fun, the Comedy Jamboree is a MUST SEE. You will laugh until it hurts.